Macquarie sells Brussels Airport stake and reduces its airport portfolio again. New investor entrants to the airport business emerge. Vinci majority acquisition of Gatwick Airport holding company stake approved. All the existing co-investors with GIP there are out; what does it say about Gatwick’s prospects? Two major airport transactions have been completed or confirmed in Europe to breathe some life into a somnambulant sector that has not seen much activity in the west of the continent just lately, despite the fact that over 50% of European airports have some degree of private ownership. What action there is, tends to be in the eastern part of the continent these days (Belgrade, Sofia, Bratislava, Athens, Montenegro etc. ), although in the main those are primary transactions as opposed to the secondary or subsequent ones in the west. The sale of Macquarie Infrastructure and Real Assets (MIRA)’s 36% stake in Brussels Airport for a reported EUR2 billion/USD3.2 billion (MIRA is believed to have invested EUR1 million in it), as well as its having exited Copenhagen Airports in 2017, marks a milestone in several ways. Firstly, because it reduces, again, Macquarie’s exposure to the airport sector. Indeed, post-Brussels, Macquarie’s funds are now limited to four direct airport investments: Hobart Airport, where it appears to want to dispose of its holding, and three regional airports in the UK – Southampton, Glasgow and Aberdeen, plus Westchester Airport in the U.S., which is an ‘on hold’ deal with no signs of a positive outcome. It is another of the sector’s giants, just like its sibling Macquarie Airports, which has gone to sleep, and it barely qualifies now as a ‘Major Global Investor’ in the CAPA Global Airport Investors Database, with the minimum criteria. Secondly, a milestone for the emergence of alternative pension asset managers and private equity/hedge funds such as the Netherlands’ APG, which together with QIC, the third largest institutional investment manager in Australia, acquired 16.8% each of the Brussels Airport management company from Macquarie. APG saw off a bid from Canada’s established OMERS and CPPIB pension funds along the way, while another one, OTTP, did not take up its option to acquire MIRA’s stake. There appears to be a trend developing where these new participants are playing an increasing role in the airport business while the established ones take a back seat. OTPP had pre-emptive rights to acquire the 36% stake, as OTPP has owned 39% of Brussels Airport Company since Dec-2014. However, OTPP and Macquarie were in dispute regarding information-sharing for other prospective bidders for Macquarie's stake. That dispute was resolved in Apr-2018, permitting Macquarie to begin the sale of its stake. Then, in Sep-2018, Belgium's Flanders Government was reported to be considering the acquisition of Macquarie Group's stake in the airport through the Flemish Government investment company PMV, which would partially renationalise it. Nothing more was heard of that proposal. The third milestone is the emergence of an entirely new ‘player’ altogether: the insurer Swiss Life AG. While it only dipped its toe in the water with 2.4% of the equity it shows the industry can still attract newcomers. At the same time, it must be said that, for now at least, Brussels Airport is a safe bet. It is not as if Swiss Life was investing in a sleepy secondary grade airport with a couple of Ryanair flights a week; as if it would. So what do they all see in Brussels Airport? BRU appears to have recovered operationally from the terrorist attack of Mar-2016, almost three years ago. 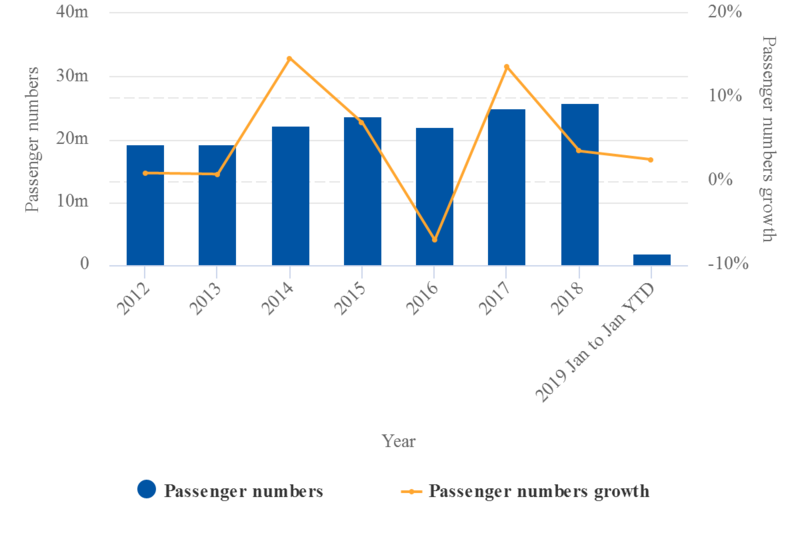 Passenger traffic fell by 7% that year, by the same margin it had grown in the previous year. It then increased by 13.6% in 2017, but by only 2-3% in 2018 and 2019 to date. Capacity has been added in every year since 2014, and in the case of cargo capacity, since 2017. DHL has a major hub there. MIRA and its co-owners must have done something right in Brussels because the salient point here is that in 2017, a year of significant growth across Europe generally, the airport grew its flight and passenger numbers at the second fastest rate among the EU's 20 largest airports. And yet, with 25.6 million passengers (2018) it is smaller than European provincial regional airports such as Düsseldorf and Manchester. Low cost airlines, led by Ryanair, which has a major (and its first-ever international) base at nearby Brussels South Charleroi Airport, has risen to 18.8% of capacity, giving BRU a better traffic mix, but the investors will be attracted more by the four fifths of capacity held by full service carriers. 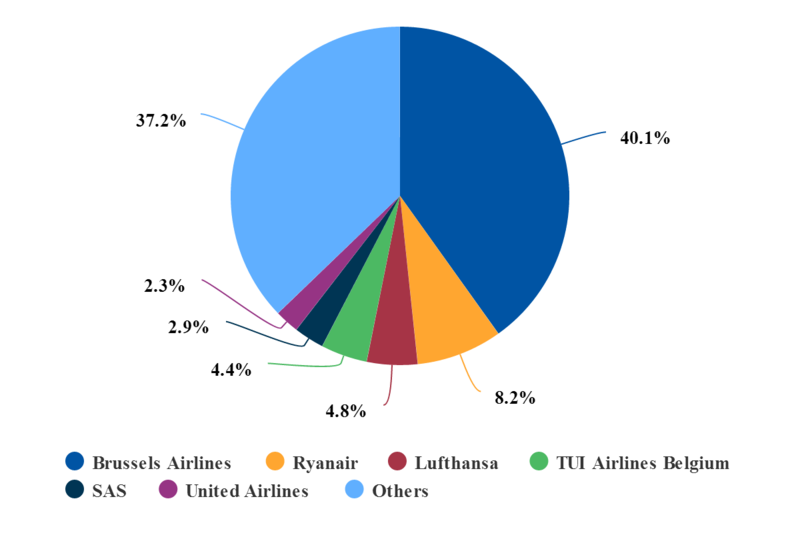 The network aspect of the airport is further reflected by the fact that only 27% of capacity is on unaligned carriers, while Star Alliance, which includes Brussels Airlines, of course, has 61%. The airport is in the midst of a USD600 million master plan development through to 2020. Brussels was originally a pair of entirely separate terminal buildings, each with its own security screening and check-in facilities. MIRA and its partners replaced a tunnel that linked the two terminals with a new connector building, which transformed the airport because it provided a single check-in and security screening point for all passengers, cutting the transit times – a critical criterion when a passenger might just as easily switch planes in Paris, Frankfurt or Amsterdam. Taking these factors into account, together with the economic and political gravitas the city has (although the long term future of the European Union and its Brussels-based Commission of 32,000 staff – and everyone else based there because of it – grows a little less certain every year), BRU is an easily identifiable location for funds wishing to benefit from stable traffic flows without undue risk. Another airport investor that went to sleep, over a decade ago, is VINCI Airports, which at one time was reduced to little more than a long-standing interest in three Cambodian airports. You would hardly believe that now. VINCI’s sectoral interests today run to almost 50 airports in 12 countries, and it is one of the biggest operators in the world. 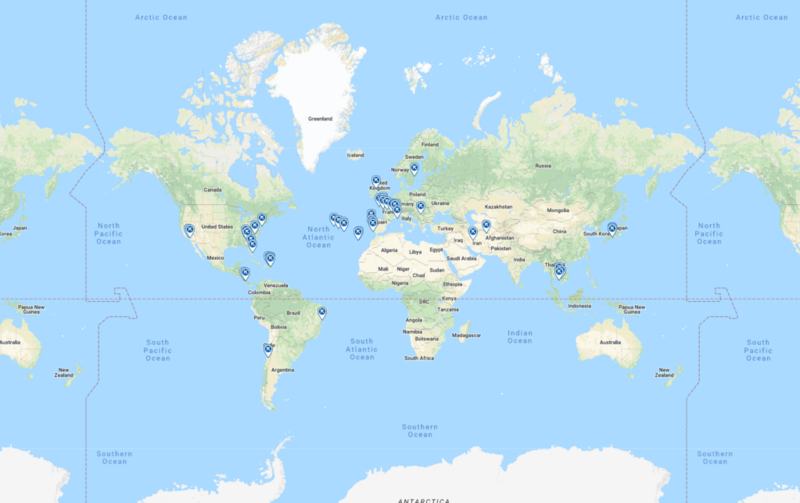 Vinci's busiest airports in which it has a financial interest, as opposed to just a management one, are in the 30 million per annum passenger range (Lisbon, Osaka), but there are few of those. (It has an 8% interest in Groupe ADP, which could increase, but at the moment that is a minority interest in the operator of the Paris airports). Acquiring the Cayman Islands-based Ivy Topco, the holding company of London Gatwick Airport, by way of a 50.01 stake, elevates VINCI in the Premier League of operators. Gatwick handled 46 million passengers last year. And it looks increasingly as if that will happen. The European Commission approved the Ivy Topco deal on 18-Mar-2019, stating that it “would not raise any competition concerns, given the limited overlap between the trading activities of the merging parties” (i.e. VINCI has few other airport interests in the UK –only Belfast International Airport – and Global Infrastructure Partners only has Edinburgh Airport). The GBP2.9-billion (EUR3.3-billion) deal was announced in late Dec-2018 and was highlighted in the (subscriber-only) CAPA report below. It is perhaps of even greater interest to observe which organisations are collectively selling this stake. The current ownership structure for Ivy Topco is represented in the chart below and has been the case since 2014. Source: CAPA Airport Profiles and Global Airport Investors Database. It has been assumed, after the failure of Gatwick Airport to acquire government approval for a second runway there, that the selling party would be Global Infrastructure Partners (GIP), which has also been linked frequently with a sale of Edinburgh Airport, which it owns fully. However, it appears that VINCI has agreed to purchase the stake from a group of investors “including sovereign wealth funds in Australia and the United Arab Emirates”– meaning Future Fund and Abu Dhabi Investment Authority, which account for 33.13% of the equity. 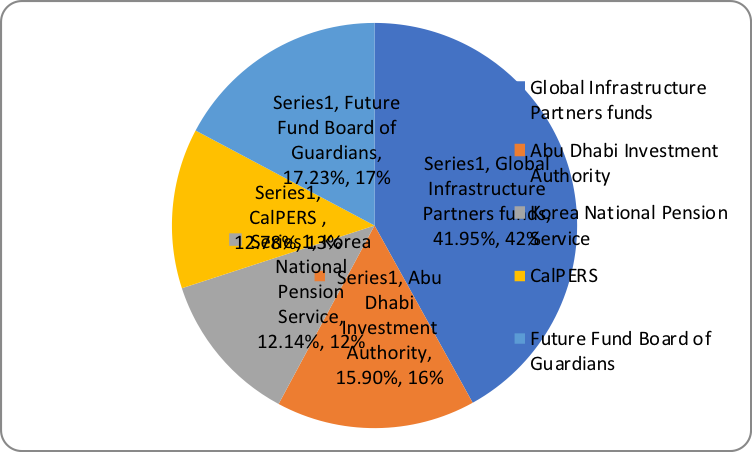 It has not been made clear which other co-investors are selling up, but presumably they must include CalPERS (USA) and Korea National Pension Service, because when the VINCI deal is completed all the equity will be accounted for by VINCI (50.01%) and GIP (49.99%), whose stake actually grows rather than diminishes. VINCI and GIP have called it correctly and Gatwick, the world’s busiest single-runway airport, will continue to flourish. The existing co-investors know when their time has come, Gatwick faces a bleaker future than when they first invested in it and they do not 'want to be part of it any longer – thank you'.